By looking at Baidu – top Chinese website and search engine – and Google – US top website and search engine – the similarities are staggering both regarding how they work and how their business model is organized. As of 2017, Baidu made most of its revenues from advertising via its ads networks. The remaining part was mainly comprised of memberships from Baidu entertaining platform. Baid also has a few other segments of the business. In fact, besides online marketing services, Baidu offers cloud services, it has a segment dedicated to autonomous driving and a segment devoted to the market leading online entertainment service provider in China. Like Baidu, Google makes money primarily via its advertising networks (AdWords and AdSense) The remaining revenues come from Google Play, Google Cloud and Hardware. A small part is related to the Google bets, a set of risky ventures where Google is investing and where Google believes the future might lay ahead. As we’ve seen both Baidu and Google has a sophisticated business model that can align businesses that bid on keywords and content producers. Also, their search service is used by over a billion users. 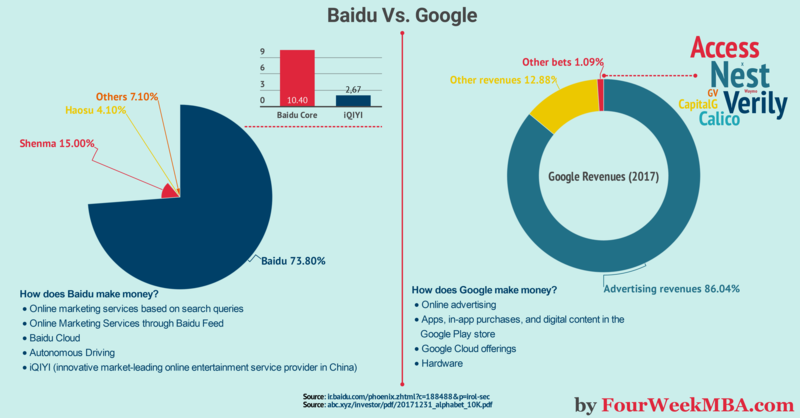 Google is many times over Baidu in terms of revenues. The search engine from Mountain View made over $95 billion in revenues in 2017, compared to Baidu over $11 billion in revenues from advertising. Many argue that Baidu is a clone of Google. Yet Robin Li has been innovating in the space of search before then Google’s founders. In 2017 Baidu invested an additional $1.5 billion in iQIYI. Also, Baidu is investing in self-driving cars. Just like Google acquired YouTube and it believes self-driving cars represent the future. Is Baidu a clone of Google? At first sight, both in terms of business model and the way Baidu works it seems to be a clone of Google. However, by looking at the Baidu origin story and how it managed to conquer the Chinese market, Baidu had managed to become among the most recognized brands in China. Thus, Baidu is an innovative company for its own sake and not just a clone of Google. Next Next post: Ok Google, Are You In Search Of A Business Model For Voice?